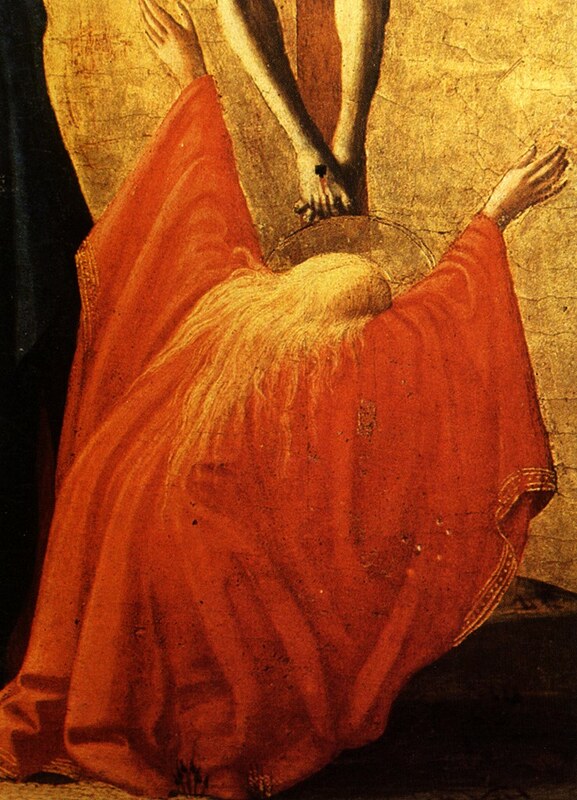 Masaccio - the nickname means 'Rough' or 'clumsy' - something about his style.? His actual family name derived from cabinet-maker. Born 1401, which is Early, the important point in this criticism. Died in 1428 "poisoned by a jealous rival" - now, who said art wasnt important? Peter then struck Ananias dead. Way to spread a gospel of peace & love. So this is the face of a woman threatened with mumbo jumbo Egyptian magic death threats. Not for withholding her capital gains tax, but for withholding a portion of her entire capital, from the Xtian apostles. The legend has it that she also then dropped dead. "The offense of Ananias and Sapphira showed contempt of God, vanity and ambition in the offenders, and utter disregard of the corruption which they were bringing into the society. Such sin, committed in despite of the light which they possessed, called for a special mark of divine indignation"
Anyway, I'm here to bring you the good news... this never happened... its a scare story to get you to bow before the non-existent Jhwh/Allah/Trinity death cult - they dont exist folks! Anyway, apologies to Masaccio for this diversion. We are concerned, with him, about the far more important task of representation. So although M is on the rough end of the smooth spectrum, he is on the popular end of the cartoon spectrum? Then there is the Popular spectrum, possibly linked to the Facile spectrum. I famously picked a Don Binney over a MacCahon on my timid foray into Peter McLeavey's in 1970 - the latter was $80 more expensive. I could have done with cousin Francis's advice at that point. In my defense, the Binney is rough,... charcoal on rough paper. Not the super smooth associated with Binney. Perhaps the most significant dimension is Time. Who did it first?
. "Unlike Giotto, however, Masaccio uses linear and atmospheric perspective, directional light, and chiaroscuro"
Similar to Science, there is the primacy of priority. 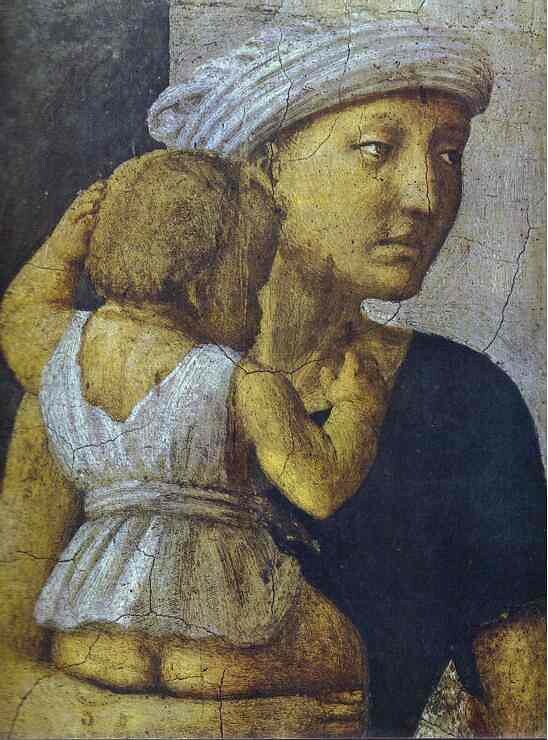 With Masaccio we have that sense of an eye opening that had never opened before. That feeling you get, on walking out of the Ufizzi, that you have just now learned to see. Every passing form and face is newly evident in space, every Florentine is a candidate model. So Masaccio is suddenly seeing the vanishing point. I guess this is far more important to him than any anti-clerical position. Sapphira's suspicious gaze is inside space. We dont actually care what peculiar cult she is suspicious of. An easily apprehended image. Rough, solid, seeing through things.